Build an incredible and amazing classic sailing ship with LEGO Pirates Imperial Flagship 10210! The LEGO Pirates Flagship is beautifully detailed and is historically realistic as well which will make you enjoy building it. This is a Lego set that is a must-have for every serious collector. Be prepared to spend 6-8 hours on this ship! Putting together 1664 pieces is not an easy task even for experienced Lego builder. Are you up to this challenge? Is this set suited for kids? Manufacturer recommends it for teens from age 14 and up, so you will have to look at simpler building toy if you are looking for a gift for your 7-year-old. This is something that you will enjoy if you love to be challenged. 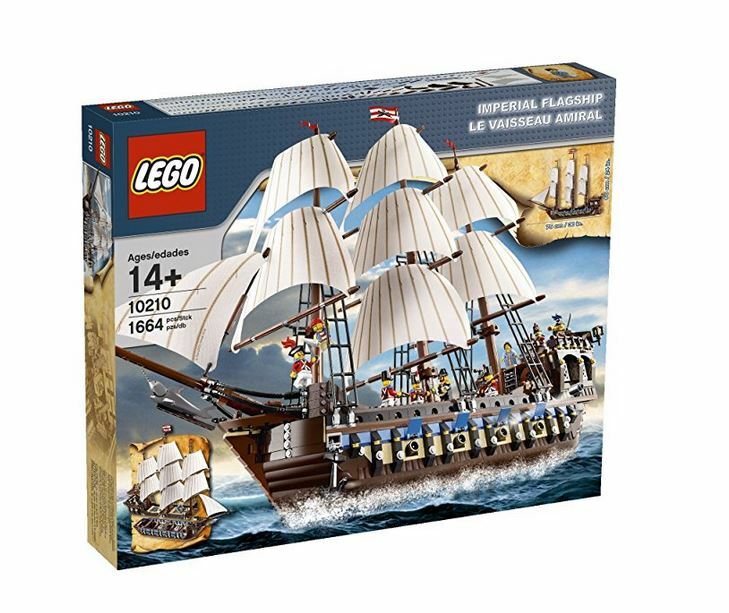 It is also more expensive than other LEGO collections, but people who have bought it have said that the Imperial Sailing Ship is worth every penny. You will be able to play inside the ship when you open the functional front deck’s doors. You can do more with this sailing ship as it has 6 opening windows, a telescope, a sextant and 3 deck lanterns. The Pirates ship includes 9 mini figures such as the captain, his daughter, a pirate captain prisoner, the ship’s cook, a lieutenant and 4 soldiers. The Flagship has three removable parts namely the main hull, the front and the back house decks. 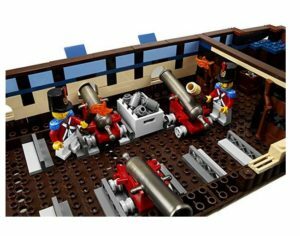 The main hull contains 4 firing cannons, torches, muskets, ammunition crates, cannonballs, a prison with a rat, saw shark mini-figurehead, a moving rudder and a kitchen that is fully equipped with fish, turkey legs, and a carrot. 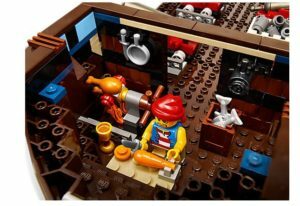 LEGO Pirates Flagship’s front deck features the opening the door to the inside of the ship where you will be able to see the masts and rigging. The backhouse deck is where you can see the captain’s chamber which contains a map, a poison bottle, and a treasure chest. The LEGO Pirates set measures 29.5 inches long and 23.6 inches tall. The seasoned collectors may notice that this is noticeably bigger than the others but still not as large as SSD ship I have also reviewed. Because of its size, it will take rather days than hours to build the ship. Multiple LEGO Imperial Flagship 10210 set reviews name it an outstanding addition to the collections of fans of pirate ships. A large number of components also means it’s a fun playset to spend your weekends on for a while. The result is a beautiful pirate ship with many functional parts that can be proudly put on display, as many others have done with it. Some reviewers call this set a must-have for any LEGO collector, while one even goes so far as to say it is the best set ever released by the brand. In fact, this person bought three of these because of that reason. Several others have called this the best ship that brand has ever produced, and one of the best sets, in general, they have ever seen. People love that there are so many fun quirks included; things like a rat you can place anywhere on the ship and a good stock of food on deck, including drumsticks. There are a few reviewers who say they have found a love for LEGOs after buying the set for a loved one and through the process of building it with them. There are also people who haven’t built LEGO sets since their childhood who have once again discovered a passion for them because of how magnificent this set is. A con some mention is the price point, but that is to be expected since this toy is hard to find these days.